Captain Black Pipe Tobaccos are the world's largest selling pipe blends, and have been for well over 30 years. 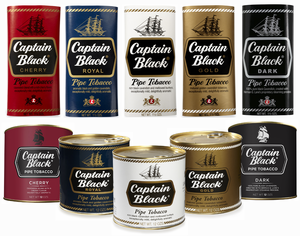 Captain Black blends started the full-aromatic craze with their full, overwhelmingly pleasant aromas. Captain Black is a light blend of carefully selected tobacco that are exceptionally mild and very aromatic. Rich blends of Cavendish, Burleys, and other fine tobaccos create an enjoyable smoke every time. Available in 12 oz cans or 1.5 oz pouches. White - Rich black Cavendish tobaccos, mellowed Burleys and Golden Virginias. Steamed to seal in the flavor and character of the leaf. Exceptionally mild, depth in flavor and delightfully aromatic. A sweet taste with hints of vanilla. Captain Black White is also available in bulk as White Crystal. Gold - Matured Golden Cavendish tobaccos are used and reflected in the bright gold color. Exceptionally mild, more flavorful and delightfully aromatic. A balanced body with a mellow taste. Captain Black Gold is also available in bulk as Gold Medal. Royal - A mixture of aromatic black and golden Cavendish with a sweet vanilla aroma. Exceptionally mild and delightfully aromatic. Captain Black Royal is also available in bulk as Vintage Estate. Cherry - A toasted Black Cavendish blend with a rich mixture of traditional matured, broad cut burley and bright Virginia. A unique and robust very cherry flavor. Exceptionally mild, delightfully aromatic. Dark - 100% Pure Black Cavendish, created with Herman G. Lane's proprietary steaming process. Sweet with hints of vanilla. Exceptionally mild and delightfully aromatic.